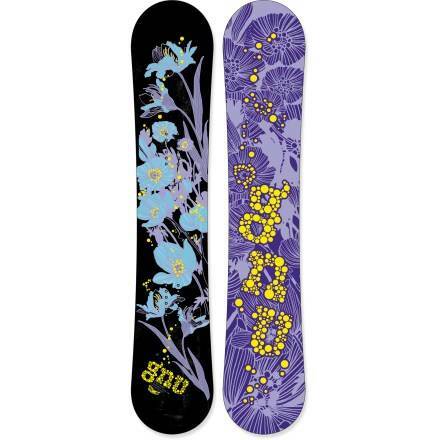 The Gnu B-Nice is a board that’s been in the line for many a year and always provides a good entry level freestyle ride for those who want to ride the park as well as have a forgiving ride on mellow mountain jaunts. It’s also an excellent ride for those learning in harder conditions. 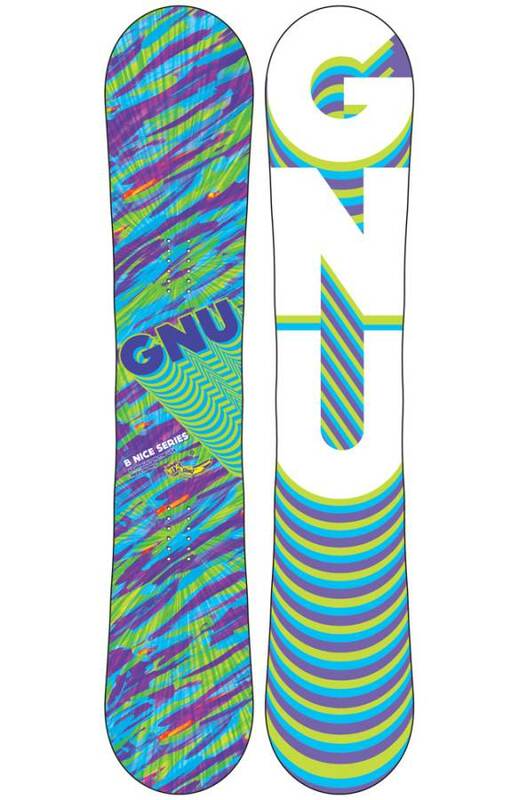 The 2019 Gnu B-Nice went to Asymmetrical technology making it a better board to turn and ride switch but now it’s best to keep it centered and ride it duck. Conditions: Some firm CO snow with some soft patches here and there. 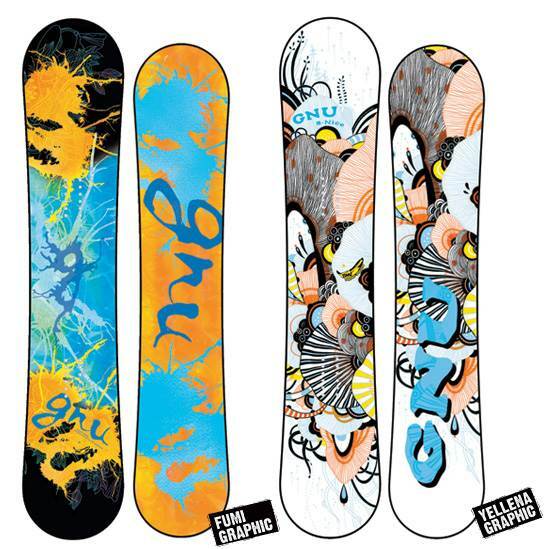 The 2014 and 2015 Gnu B Nice offers a slight change up on the BTX we have seen for many years. The addition of a very straight to mild camber offers a slightly more stable ride between the feet that allows you a little more of an all mountain freestyle friendly ride. For the price, this is a great ride but we’d love to see a setback stance and C2 BTX to make this fit more of a wide range of riding styles. As it stands now it’s a good entry level freestyle bordering on all mountain freestyle board for riders on a budget. The tweak to BTX this year changed up the ride making it a little more stable and a little more poppy off the tip/tail. On Snow Feel: The 2014 Gnu B-Nice offers a little more stability between the feet and although it doesn’t offer the stability of C2 BTX it’s better than the older BTX. It’s gone from being loose to being on the low end of semi stable. Powder: Same great performance in powder (for a twin with a centered stance). It’s got an easy float but it’s not going to compete with a similar shape that has a set back stance. Turn Initiation and Carving: So the Gnu B-Nice feels the same edge to edge when making short to medium radius turns but when you start getting into wide to carving turns you can feel a little difference of at least we thought we did. It seems to be a little less washy. It’s an improvement over the older BTX but not in the same league as C2 BTX. It’s still at the bottom rung of their camber profiles when it comes to getting spring out of your turns or carves. 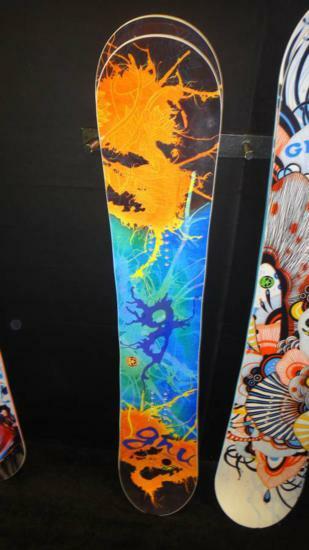 It grips the snow well but the tip/tail doesn’t give you that spring out of the turn that boards with more camber do. 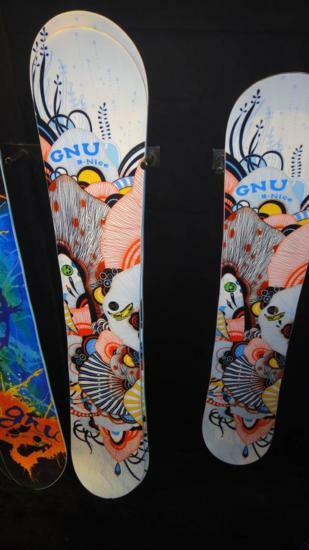 Speed: The Gnu B-Nice has the same kind of feel as the older BTX boards when it comes to speed. It’s not that fast and can get a little chattery and unstable if you look to bomb a long steep hill. On the plus side, It’s got a base that glides well and doesn’t need much maintenance. Uneven Terrain: Same great performance on uneven terrain. It’s very easy to deal with the end of the day bumpy snow you might see on a Saturday. Flex: Same medium/soft flex that makes it easy to butter, press and plays around. Over time it softens up and it makes for a better park board than a dabble with the mountain kind of board. Switch: Perfect switch but it’s a true twin. Jibbing: The Gnu B-Nice is a great jibber for a full-size board and makes it pretty easy to play around on most jibs while still having enough board to play around in other places in the park and to a lesser extent the mountain. Pipe: Great edge hold in the pipe but it doesn’t have that wall to wall drive that many Mervin boards have with a little more camber going on in the profile. That being said it’s more than fine for learning how to ride in the pipe and it’s very forgiving. Jumps: Pretty good spring from between the feet for ollies and with the new profile it’s not bad trying to ollie off the tail as well. The C2 BTX or other hybrid camber models handle an off landing better than the Gnu B-Nice. Still, it’s pretty forgiving and good for getting small to medium sized jumps down. The Gnu B Nice BTX is a great all moutnain freestyle beginner-intermediate ride and a pretty good freestyle ride for more advanced-expert riders on a budget. This design has been in place for a few years now and despite the fact we think it needs a C2 BTX upgrade it’s still a great board. Especially for those who ride in icy conditions. On Snow Feel: This is a loose between the feet kind of ride that is made for just playing around the mountain. There aren’t many stable moments here except for powder or pretty soft snow. One footing and flat basing can be a bit unstable when conditions are firmer but it offers up a really playful catch free approach to the mountain. Powder: Its very good in powder until it gets pretty deep. It’s more on the average side of Good but it’s still great for a twin. If you want to take a freestyle approach aka riding switch and regular the BTX continuous rocker shape will make this a lot easier to float than camber but not as easy as a setback directional stance. Speed: Their are definitely other boards out there that are much more speedy but they don’t have the all around riding qualities built in as well. You can really neglect the base of wax and it will still ride very well. The one drawback from BTX is it isn’t as stable as their C2 BTX or C2 Power Banana when it comes to speed. It can be a little squirrely between the feet when picking up real speed on the mountain but in most places in the park it’s fine. Uneven Terrain: It’s handles the end of the day groomers or bumpy off the groomers snow very well. It’s all about dealing with bumps and uneven terrain well. It’s got some shock absorption when you have to slow down for messy areas on the mountain. Approximate Weight– Its not the kind of board that makes you forget its on but it’s not necessarily a heavy weight either. Turn Initiation/Carving – The turn initiation is incredibly easy. It has a very skate like feel which can make for a great park ride. Edge to edge transitioning is incredibly easy which is great for entry level riders. If you like to work a bit for your turns then stay away. When it comes to carving the B Nice is not going to be that good. The more you commit to a carve the more washy it becomes. It doesn’t have that spring out of the turn feel either but that is a common problem with all continuous rocker boards. 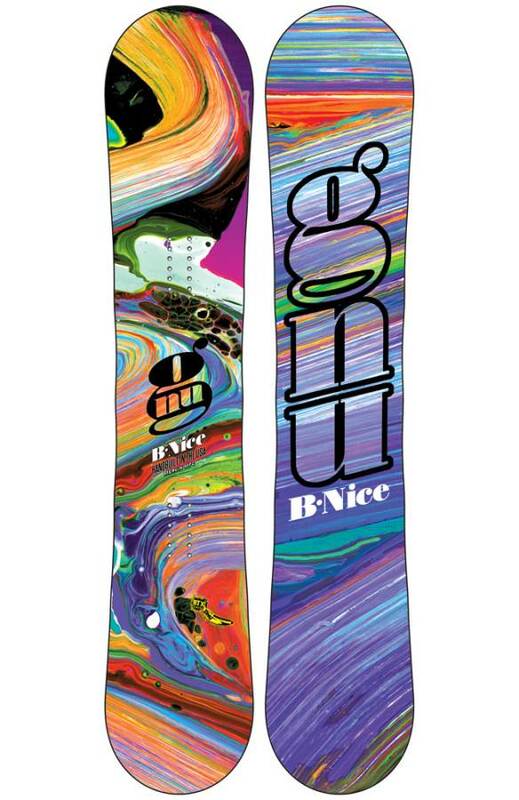 The B Nice is more of a freestyle board these days so if your priority is carving we suggest looking somewhere else. Edge Hold: Magnetraction took this board from a score of Good to Excellent. Before you would cringe on a continuous rocker board without magnetraction if you saw a long patch of ice but now don’t even think about it. The edge will hold. Flex: Its right in the middle and combined with the btx continuous rocker shape it’s pretty comfortable riding from jib park to the pipe. Pipe: Pretty fun in the pipe. Holds well thanks to magnetraction but it’s lacking the wall to wall drive that an advanced to expert rider in the pipe. Jibbing/Rails- Very good for learning most of the jib’s a mid level rider would want to take on. If you want to go bigger there are more jib/rail specific boards like the B-Street. Jumps: The B Nice doesn’t handle jumps like others can but it’s very predictable and forgiving when it comes to landing a small to medium sized kicker. It’s still pretty poppy if you want to create your own air around the mountain. 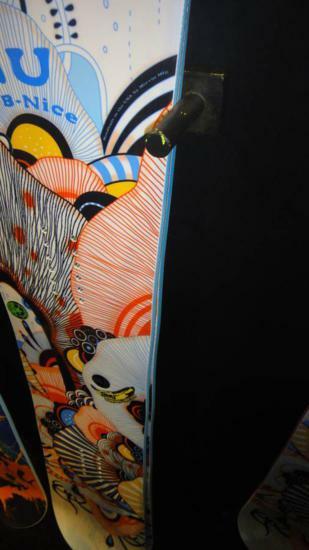 We try to get as many images of the Gnu B-Nice, but forgive us if they're not all there. My first fun board! Been riding steep icy eastern mountain for years with a stiff blade. Switched to this sweet board last year and can do it all. Powder, slush, ice , haha! Rocker and Magnetraction!